Some of the most popular graphics on the Internet are pirate web graphics. Everyone loves pirates, kids and adults alike. This is why you can find pirate themes for bedroom decor, Halloween costumes and even birthday decorations. Regardless of which style of graphics you prefer, within the genre of pirates there is a whole range of styles - from fun and innocent to dark and even a little risque. People like using pirate themes for Halloween web pages, personal blogs, or even to decorate their cellphone or computer background. The following sources for pirate graphics online are organized into two categories, clip art and cartoon style, or realistic pirate images. Either category has volumes of free resources for you to find excellent graphics for your use. The following websites offer great listings for pirate themed graphics, perfect for websites that are intended for children or for quirky MySpace pages. Lee Hansen Graphics offers free clip art and crafts for "creative arts and scrapbooking." However, most of these are GIF files that work great on web pages as well. Some of her text graphics are wonderful. Clip Art Guide provides a whole collection of cute and goofy pirate graphics that both kids and adults would find entertaining. Classroom Clipart offers several pages of cute pirate clipart for web pages. The websites below provide free images of realistic pirate themed graphics for web sites and blogs. All of the sites below provide lists of images that are royalty free. In some cases you need to provide links back to the source, but in many cases you only need to be sure not to resell them or give them away as your own. Karen Whimsy provides a number of amazing artistic renditions of pirates throughout the ages. She includes categories like pirate artwork, famous pirates, and other pirate pictures she created herself. 123RF has a number of realistic-style pirate images amongst their collection of stock photos. 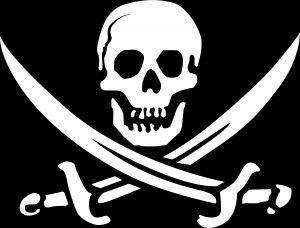 Fotosearch lists over four hundred royalty free pirate pictures.